Curious about past-time clairvoyance and clairvoyance of distant scenes? Interested in developing your astral senses and gaining personal psychic influence over others? Then join Swami Panchadasi for twenty lessons in developing the outstanding powers of mentalism! Prepare for your own adventure into worlds beyond our everyday perceptions with Swami Panchadasi’s Clairvoyance and Occult Powers. First published in 1916, this metaphysical classic by occultism pioneer William Walker Atkinson’s guru Swami Panchadasi (who, it turns out, was actually Atkinson writing under a pseudonym) offers training for anyone to master a range of telepathic talents. From crystal gazing to clairvoyant reverie, psychic healing to astral travel, transference, and psychometry, the lessons are sure to delight student and adept alike. 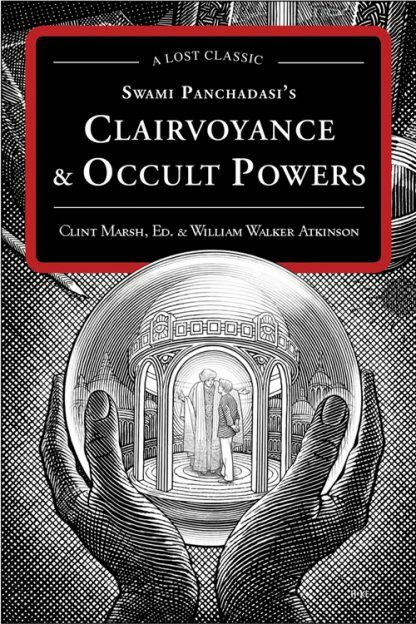 The introduction by Clint Marsh, author of The Mentalist’s Handbook, takes us into the strange and multi-faceted life of William Walker Atkinson, a turn-of-the-century occultist, and a real Guru’s guru! A powerful book of knowledge, Clairvoyance and Occult Powers will confound and enchant readers today as it did nearly 100 years ago.